Christmas is my favorite time of year to play games. 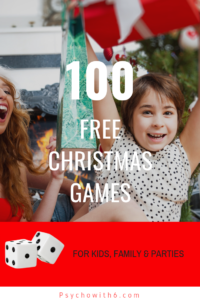 You’ll find a list of 100 Christmas games for families to play, for kids to play, or for Christmas parties. Be sure to pin this post so you can refer back to it every year. Christmas Family Feud is a fun game based on the popular TV show. This link includes directions and common holiday questions. Christmas Lights scavenger hunt is a fun scavenger hunt for the whole family. The Christmas Story Scavenger Hunt is perfect if you’re looking for a Christian based scavenger hunt. Christmas Decoration Scavenger Hunt is a way to focus on the beautiful decorations of the season while playing a fun game. These Christmas Reindeer Minute to Win It games will delight adults and children of all ages. Super fun Christmas Drawing Game where all you’ll need are sturdy paper plates, pens, and your family and friends. Fun Christmas Tree Trimming Game Decorate your best friend or youngest child and turn them into a Christmas tree with crepe paper. This Christmas Smell Game is so much fun and will challenge everyone at your party. Place your favorite Christmas smells in jars, blindfold your family or friends and see if they can identify what they’re smelling. Christmas Rollick is a Reverse Charades game. Bible Christmas Trivia is the perfect family game. This free printable is just the perfect resource. You’ve Been Jingled! Is a fun way to celebrate the holidays with your neighbors. Christmas Word Scramble can be turned into a game where the first one to complete it wins the game! Christmas Party Improv Game This game is hilarious and is perfect to play as a family or include it for your party. The Candy Cane Card Game is played like Spoons but you use candy canes! Cut the Candy Bar Game The object of the game is to eat as much of the candy bar before someone rolls a double. DIY Christmas Jenga All you need for this game is a Jenga game and the free printable. Homemade Bananagrams Customize this game to your Christmas theme. It’s an anagram game that drives you bananas! Truth and Lies About Christmas Games This is the Christmas version of Two Truths and a Lie. Players guess which statement is a lie. Stick it Fun Christmas Game Players have a designated time to throw as many mini-marshmallows as the can into Santa’s shaving cream beard. Do You Hear What I Hear Players will rearrange the gift boxes based on the number of bells they hear in each box. Don’t Ring the Christmas Bells is a fun sensory game for small children. This game will allow even the youngest children of the party to join in the fun. Christmas means snow in many areas but if you don’t get snow your kids can still have fun with this Snowball Toss Game! The Poke-A-Tree Game is perfect for the kids at your party. Included are video instructions and free printables for this game. Christmas I Spy Game is a fun Christmas game that will keep your kids busy as they search through the colorful free printable. Candy Cane Catch is a fun game where your little ones will fish for candy canes. This simple game only requires a few supplies. Naughty or Nice Christmas is a children’s version of the game which involves throwing coal into Santa’s buckets. Candy Cane Hunt. Hide a bunch of candy canes and the child that finds the most candy canes wins. Ornament Number Matching Game This is a fun game involving cutting, numbers, and matching. Santa’s Beard Roll & Count Game This is a sweet game involving Santa and marshmallows. It works on fine motor skills and math. Rudolf Balloon Race – combine fun with physics with this balloon race. Grow a Christmas Tree Farm Math Game uses the book The Christmas Tree Farm and teaches literature and math while playing! Away in a Manger Minute to Win it Game is a team game for kids. Each team has a minute to use as many props as they can. Jingle on the Trunk Minute to Win it Game uses jingle bells and tissues boxes. Be the first one to bounce the bells out of the box. Build a Snowman Game. Take one minute to blow three ping-pong balls across the table and try to line them up to build a snowman. Launching Snowmen Game is a two for one! A fun game and a Science lesson. North Pole Game is a ring toss game made to look like the North Pole. Snowball Transfer Game. This a timed game will delight little ones as they use a straw to transfer their “snowballs” into a bowl. Bow Run. With a bucket on each side o the room, each child will take turns transferring bows from one bucket to the other. Lucky Line Gift Exchange Game. Here is a unique game that gives a surprise gift to the winning player. Pass the Present Wheel Game uses a DIY printable wheel that guides you as you pass the present. Put the Baby in the Manger. Rather than pinning a tale on a donkey, young players have to Put the Baby in the Manger. Roll a Reindeer Game is a game your preschoolers will love! Use the free printable and have fun learning. Roll a Snowman Dice Game With each roll of a die your preschooler will build a snowman. Christmas file folder games are fun learning games that can be played at home or taken to a party. Do You See What I See? One player will hold a Christmas object and the other player will have to draw it by listening to a verbal description. Christmas Rhythm Game Cards This musical game is customizable according to the age of the children playing. Christmas Pom Pom Drop will be a fun way to help your kids celebrate while developing their fine motor skills. Christmas Picture Puzzle Game for elementary age children only requires this free printable. Try December Would You Rather Prompts for a fun Christmas game for older kids. DIY Holiday Reindeer Ring Toss is a game for children and adults. This game is easy to make and fun to play. Santa Says is a game that is a playoff of the classic game, Simon Says. Use the free prompts to make this the highlight of your party. This Pin the Heart on the Grinch game is perfect for your party especially if you a Grinch or two attending. The Nativity Game and Craft is perfect for your littles. Printable Holiday Lights Scavenger Hunt is the children’s version of the Holidays Lights Scavenger Hunt. Christmas Roll a Story Game. Children take turns building a story with each roll of the dice. Christmas Mad Libs will be a fun game for kids all the way to adults. You can print out Mad Libs according to Christmas Themes. There’s even a Mad Libs for preschoolers. Snow Shovel Race is a simple game to plan and a fun game to play and will also help with fine motor skills. The Snowman Slam Game is a fun game made with Styrofoam cups. Simple to make and hours of fun. Pin the Nose of the Reindeer takes the popular birthday game and turns it into a Christmas party must! Toilet Paper Snowman Game can be played by kids of any age! Download your favorite What’s In Your Phone game and use it as the perfect icebreaker for your party! Print off these free Christmas Photo Booth Props and have loads of fun at your party. Build anticipation with your young guests by offering each an envelope. The one Who’s Got the Santa wins the game! Simple, exciting and fun! Name that Christmas Tune and How Do You Dooo are two Christmas music games that are sure to please everyone at the party. The Christmas Word Scramble Game is an engaging game that doesn’t require a lot of physical energy. Christmas Cans Bowling is so much fun for kids. You can use a Cricut to produce similar labels or purchase Christmas vinyl cling or stickers. Snowman Toss requires a little bit of prep work but the result will be worth it! Create a snowman with 3 boxes, tape, and homemade beanbags. Punch a Present Gift Game is a game and gift giving all in one! Candy Cane Snag is a holiday twist on the classic game Tag. Sing Song Ping Pong The room is the “table” and the song is the ping pong. Make this a fun game with Christmas songs. This Christmas Trivia Powerpoint is a great game for teens but can be played by everyone at the party. Christmas Carol Pictionary Relay. Race to draw Christmas Carols and try to get their team members to guess them. Candy Canes is like the classic game Spoons but exchanges those spoons with candy canes. You might want to keep this game for older kids and adults, it could get a bit rambunctious. Christmas Who Am I? Each guest will have the name of a fun Christmas character taped to their back. They will try to guess who they are based on the clues the other guests give them. Christmas Charades is a must for your Christmas party! Charades is a classic game enjoyed by families and party goers everywhere. Pass the Presents White Elephant Gift Exchange Game puts a new spin on the traditional White Elephant exchange. Ready or Christmas is a fun Christmas icebreaker for your party!. Ring a Bell Christmas game is super easy to plan for and super easy to play. All you need are friends, family, and a bell. Christmas Oven Mitt Game will bring laughter as your guests try to open wrapped boxes using oven mitts. 20 Questions Christmas Game challenges players to guess an object with twenty questions. Christmas Carol Catch Phrase using free printables and non-Santa themed songs. The Saran Wrap Ball Game is a game that doesn’t need to be played in the kitchen. This free game idea is sure to be a crowd pleaser. Fat Santa is a hilarious game involving the largest sweat suits you can find and balloons. The winner of this Right-Left Game- Uses for Fruitcake gets to take the fruitcake home. Let’s Make a Deal is a fun party game that can be easily adapted to your Christmas theme. Gift Wrap Twins Game This game is for teams of two and is fun for all ages. Lapland Limbo – Try doing the limbo under a string of Christmas cards with a Santa sized belly. Reindeer Antler Game This game is sure to have everyone at the party laughing hysterically! Face the Gingerbread man only uses your face muscles (no hands) to get the cookie into your mouth. Who Am I Game plays with cards placed on the player’s forehead and then they have to guess who they are. 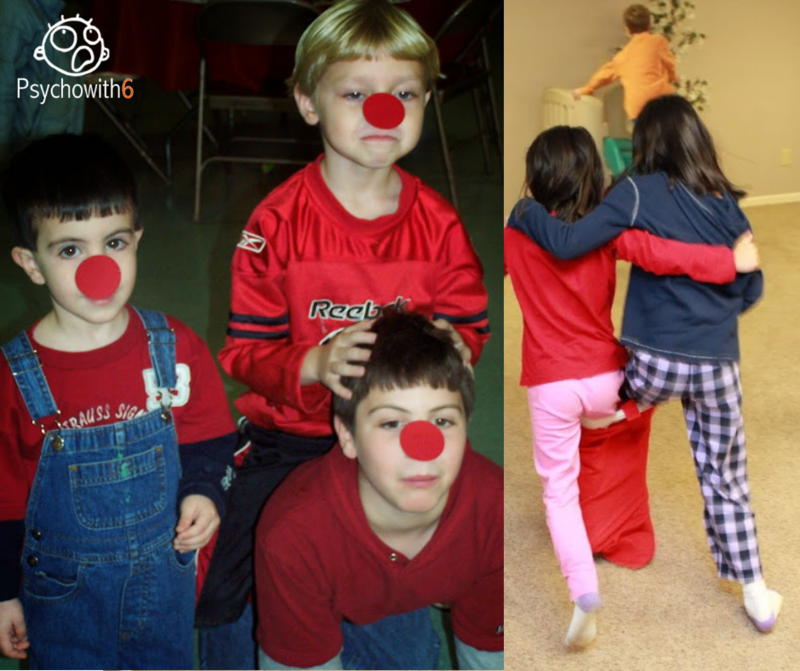 Christmas Balloon Antlers Game is the perfect game for large groups of people. Gingerbread Cookie Relay Exactly what it sounds like, a relay using gingerbread cookies. Olaf Knockdown Game Create these easy Olaf cups, stack them and have the kids at the party try to knock them down. Indoor snowball soccer game. Snow & soccer balls are not required but you will need some space for this game. Musical Chairs Gift Exchange This fun musical chairs game involves Christmas music and a gift exchange. Christmas Card Balderdash. Play this traditional game using Christmas cards. 99. The Impossible Test Christmas is a free app that can be played with family and friends. It features Christmas trivia, holiday jingles and unique games. Available on iPhone and iPad. 100. Christmas Bingo Santa’s Gift is a Christmas Bingo game you can play on your devices. Available on Windows, iTunes, Android, and Google. Here’s a bonus if you love Karaoke. Try the karaoke app called Smule. There’s a large collection of Christmas songs to keep your party lively! Download on Apple products, Android, and Windows. 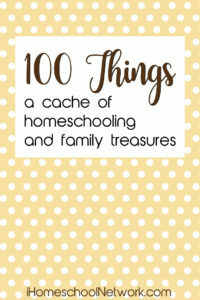 Find more 100 Things posts for homeschooling families right here.